We believe in living an organic natural life and co-existing within nature. We collect water from the sky, energy from the sun, and we recycle anything we can use. Our buildings are made from cob clay, earth-bags, bamboo and recyclables. Our hopes and dreams are to inspire people that come to stay with us to live a little differently and educate them on permaculture and organic living. 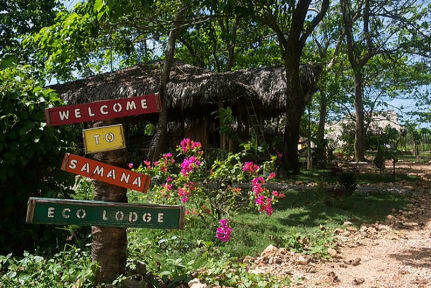 We are located in the small town of El Limon in the province of Samana, 7 minutes away from the beautiful waterfalls and the beach. 15 minutes ride from the kite surfing town of Las terrenas where you can find bars, restaurants, beautiful beaches, scuba diving and more. There are many tours that you can find around here, like the waterfall, the coconut and cacao farms, cayo levantado and los haitises and many more. 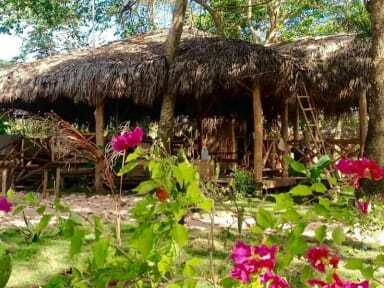 We offer: 4 private huts with double beds, a big spacious dormitory, 4 colorful glamping tents, and bamboo toilets with open-air showers.Breakfast, lunch & dinner Tours: Horseback rides to the waterfalls and deserted beaches, zip lining and sunset barbecues on the beach. Future projects: Coming soon- Organic swimming pool, volleyball court, hobbit houses made from clay, tree houses, a yoga deck and more tours. Reception is open from 7:00 -22:00.